The Oyo State Police Command has taken into custody a 32-year-old man, identified as Saheed Oladimeji, for allegedly beating a 14-year-old boy, Matthew Ohiosumuan to death over the accusation that he attempted to defile his six-year-old daughter, Solia. The incident was said to have occurred on May 5, 2016 at Adagbada area, Arola Community in Ido Local Government Area of the state at about 5p.m. According to Crime Reports, Oladimeji allegedly kicked and threw punches on the deceased until he became unconscious and finally died. But the suspect claimed he only slapped the deceased’s buttocks and whipped him with rope. Oladimeji said, “Matthew was the son of our next-door neighbour. “On May 5, he called my daughter, Solia, to run an errand for him, but shortly after, I heard my daughter saying ‘Brother Matthew, leave me alone’. “I called out to her to come back home and as she came, her looks were hard and she was holding her underpants. “I asked her what went wrong and she said it was Matthew who removed her pants and slept on her. “Immediately Matthew saw me questioning my daughter ,he ran away. “When Matthew’s brother, Seun, came from school, I reported the former to him. Later, I asked one Abdulahi to call Matthew for me. “When he came, I asked him why he did what he did to my daughter, but he denied it in the presence of his brother, saying that he only asked her to buy rice for him. I called my daughter and she repeated what she told me. “I took a rope and used it to whip Matthew and in the process he ran away. As he ran, he fell face down and fainted but I thought he was pretending. “I never intended to injure the boy, as I always encouraged him to face his studies or learn a vocation, so that he would be a responsible boy. He was close to me and I used to advise him a lot. I also used to give him clothes that had become tight on me. “I am so pained by his death because it was unexpected. I pray that God should save me from this problem. If God should get me out of this, I would never beat any child, even my own child,” the murder suspect said. Matthew’s brother, Seun, explained what transpired between the suspect and the deceased thus, “Oladimeji told me that my brother attempted to sleep with his daughter and showed me a rope that he intended to use to tie him down so that he could discipline him. When Matthew was called, he denied the allegation but the suspect did not believe him. “He first whipped him with a rope and I told him that the reprimand was enough but he did not listen to me. “He started raining blows on his head, and two sides. This made Matthew to fall down but this did not deter Oladimeji. “He started kicking the deceased so hard that passers-by had to caution him not to kill him. But he replied that if Matthew died, he would go and bury at Powerline Cemetery at Apete. The father of the deceased, Mr Femi Ohiomasuan, said that Matthew was the only child his mother had for him. 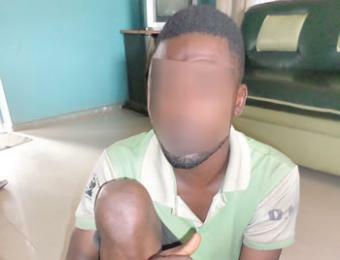 The Oyo State Police Public Relations Officer, PPRO, Adekunle Ajisebutu, while confirming the story, said that the suspect had been charged to court and remanded in prison.